a good life. : run run run! // my love hate relationship. well, you guys asked for it! so here it is. 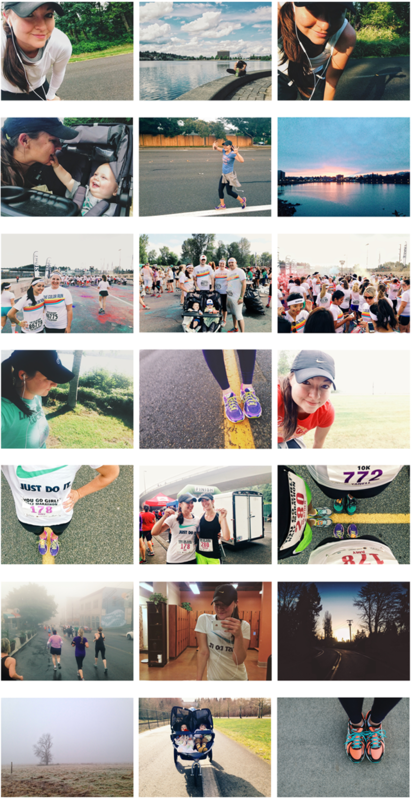 a photo dumpy post all about my second favorite past-time, running (number one is my love affair with my camera, of course!). gah, running. i love it, i hate it. i feel like my greatest joy from running is the sense of accomplishment i feel afterwards which means i like it the most when it's over. as you can see below, i'm the post-run selfie queen because after a run i feel SO GOOD. but during? sometimes it's awful. sometimes it hurts & i wonder how much longer til it's over. every now & then i hit my stride a few miles in, the right song comes on & i get that feeling like i could run f.o.r.e.v.e.r... i picture sam & my kiddos cheering for me at the end of a finish line & i run a bit faster. the "runner's high." that's the best. running is addicting because it doesn't take long to see improvement. you go longer & faster with each run & it becomes super rewarding to see your progress. but that in itself can be dangerous because then each run has pressure to be better than the last & you're not just running anymore to run. right now i'm training for my second half marathon. i'm using a training plan by hal higdon & trying to run this one under two hours (13 nine minute miles) but no big deal if i don't. i love the structure that comes with training for a race because it forces me out the door when i would otherwise probably find a reason not to go. it's raining, i'm tired, i'm having a good hair day, i already showered, i don't wanna push the stroller... all reasons that keep me from stepping out that door. oh & of course, it's gonna be hard. it's always hard. things that help me on my runs: good music. a running buddy. knowing that i can slow down or walk if i need to. good shoes. compression tights. food in my belly. an empty bladder. a hat (i hate running with sunglasses & i hate running with the sun in my eyes). a new route. energy chews. a sunny day. a goal. and that's that! seeing all these pictures & writing all this out has made me excited for tomorrow's run. i'm just doing three miles but i'll have the stroller & getting through any sort of run with those two in front of me is a feat. i'd love to know how many miles those two have ridden with me! and i'd love to know about your relationship with running. why do you or don't you run? do you genuinely love every mile? am i the only one that pushes through just for the feeling at the end? or are there people out there that love every step of each run? i'm sure they exist but it sure isn't me. running is work. each time i run it hurts & it's hard. but for some weird reason i love it & i've ran too far to quite now. I've been a runner off and on for several years but I finally committed to a half marathon in December. I finished in 2:13 and couldn't have been more excited! But I'm with you: I run for the feeling afterward. Some days, I feel like running is a stress reliever and I can feel my negative feelings ooze out with the sweat. (Pretty picture, I know.) And other days, I feel obligated to run. I struggle to get out the door, but I just think about how happy I'll be AFTER. It usually works. I also battle with the pressure of always needing to do better. When I'm not training, I sometimes have to stop myself and say, "Just because you ran 5 miles yesterday does NOT mean you have to do the same today." It's almost like I feel like I'm failing if I don't do more than I did the day before. I think that's possibly my biggest struggle with running. I also have a bit of an on and off again relationship with running. I was a star on the cross country team in high school and even ran my freshman year of college (until it was too tough to combing running with an engineering major). Then I took about a 10 year hiatus. I had 2 kids, did group exercises at the gym, etc. However, now I'm really back into running. As a busy mom, I feel like running gives you the most bang for your buck. In 30 minutes I get a great workout and I didn't spend a ton of money on a gym membership nor lose the time traveling to and from the gym. I participate in a few 5Ks and hope to do my first half marathon this fall. I'll definitely check out the training program you posted. I ran when I was younger, and enjoyed it, now I watch others run and still enjoy it. Thanks for letting me visit. This article is much helpful to build an excellent Love and Relationship. love reading this. I have to say I love the run itself. Lately I do it for stress relief and it just feels good to clear my head. I get into that zone and keep going. It's so true though that once you have a longer run it then becomes like an unspoken goal to do it again. I had to talk myself out of that yesterday. I'm not huge into distance but last week I ran 6 and then yesterday I stopped at 4 simply because I had to tell myself I don't have to do 6 or more! Haha! !